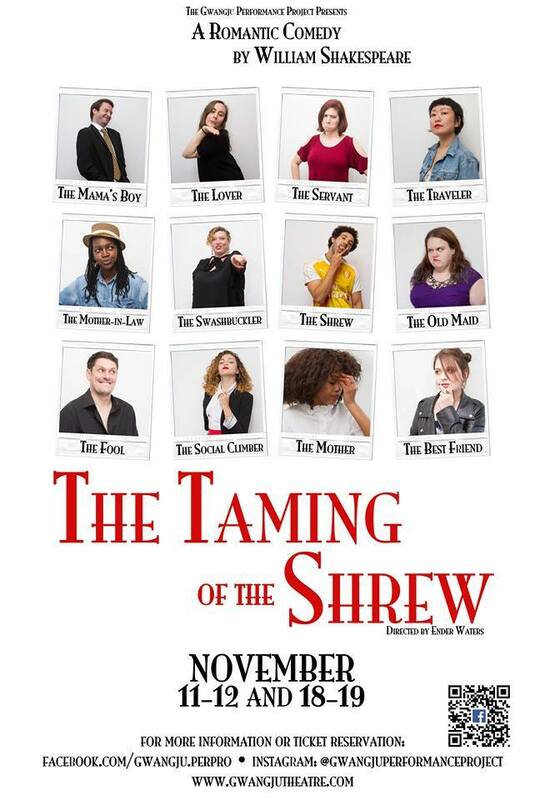 Gwangju Performance Project will stage William Shakespeare’s comedy “The Taming of the Shrew,” but with a twist: The roles are gender-swapped. In the play, Lucentia wants to marry Bianco, but cannot until his bad-tempered older brother Cato first finds a wife. The plot revolves around efforts to tame Cato and allow Lucentia to get her man. Shows are Saturday at 3 p.m. and 7 p.m. and Sunday at 3 p.m., and again at the same times the following weekend. Tickets are 8,000 won to the early Saturday shows, after which there will be a 30 minute question-and-answer session. Other shows are 10,000 won in advance or 14,000 won on the door. Korean subtitles will be shown at all performances. See the Gwangju Performance Project Facebook page for reservations and more information.